from Administration > Choose Company > New > New Using Wizard. from Administration > System Initialization > Implementation Center > Implementation Tasks > Configure Company Settings. Note: The Express Wizard covers the most common settings needed for a new company. However, you may still need to access the Administration menus to complete the settings. Enter the Site User Credentials (Site User ID, Site Password) to open the Express Configuration Wizard. We have a 31-day trial version if you want to work without installing a license. 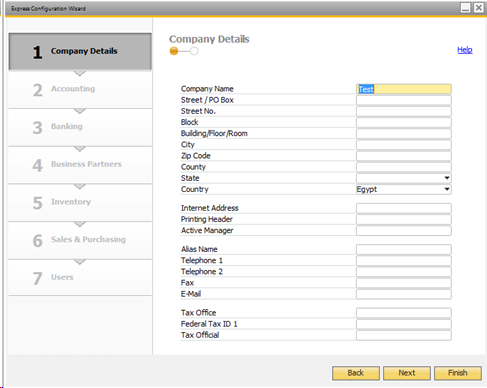 You can choose to copy the user-defined fields, tables, and objects from your existing company to the new company. Since you can’t change the Localization after the company has been created, for this step you must be careful. 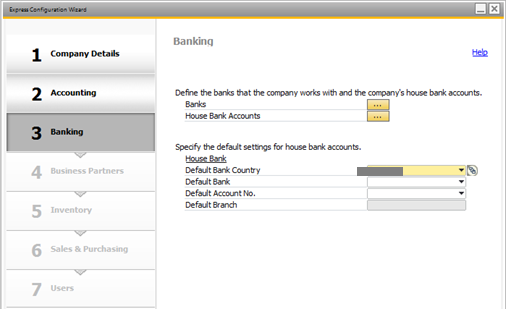 SAP Business One is supplied with a Chart of Account Templates for a selected localization. If you choose the “template” option, a default chart of accounts will be created automatically based on the localization, but you can edit these accounts as desired. Alternatively, you can choose the option “User-defined”. Only the top-level drawers are provided in a user-defined chart of accounts, allowing you to manually add accounts to the drawers. 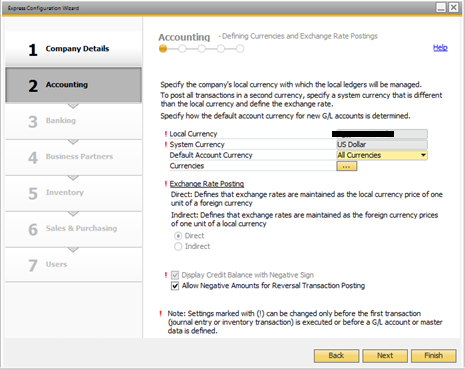 Note: You can’t change the Chart of Accounts option after you’ve made a transaction in the new database. For the User Interface, you can select the Base Language which can be changed at any time. It can also be changed for any user. Finally, you must define the Initial Posting periods for the first fiscal year. 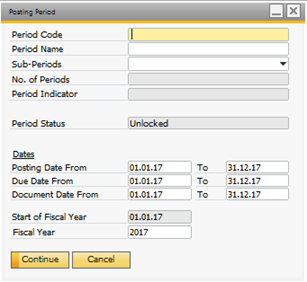 If you want to import or post journal entries or transactions for previous years that came before the fiscal year, once you’ve defined the initial period for the current year you can’t add posting periods for previous years. When you create a new company, the “manage” user is created by default. 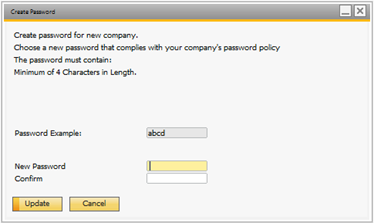 You can set up its password after your first log into the new company. 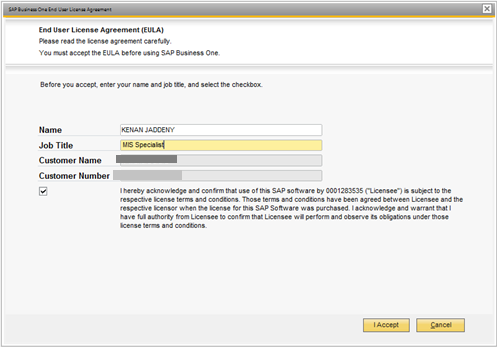 After that you must accept the End User License Agreement (EULA) before using the SAP Business One. 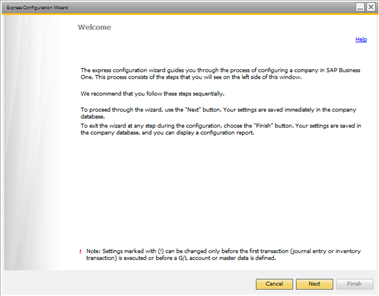 You must also enter the NAME and JOB TITLE for the one who worked on the establishment process of the new company on the SAP Business One, then check the box that indicates your acknowledgement of the EULA, and finally hit the “I Accept” button. Now, you’re all set for the pre-establishment step. 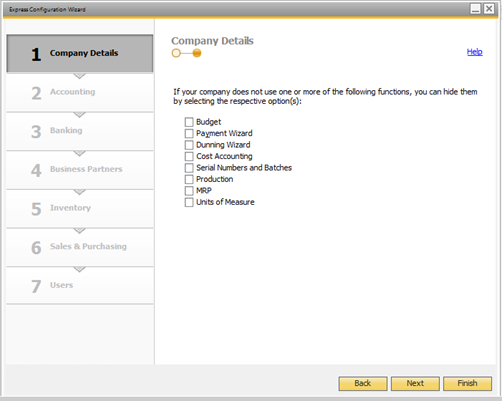 Now you’ll continue through the Express Configuration Wizard through the Administration model of the SAP default models. Open the Express Configuration Wizard from Administration > System Initialization > Implementation Center > Implementation Tasks > Configure Company Settings. Now you’re in the Express Configuration Wizard and ready to dig in! Note: Settings marked with exclamation mark(!) 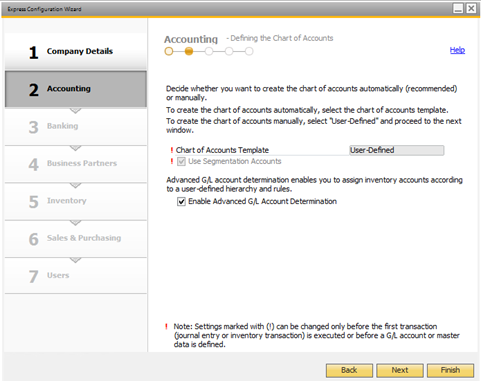 can be changed only before the first transaction (Journal Entry or Inventory Transaction) is executed or before a G/L account or master data is defined. First in the Company Details you must check the accuracy of the information that you’ve previously entered and fill in any empty gaps you may desire. If you don’t use one or more of the functions listed on the left side, you can simply check its box to avoid its appearance in the main models. If you use all of them, you don’t have to check anything, just click the Next button. There are several screens for setting up accounting options, including Local and System currencies, the default account currency, and currency exchange rates. 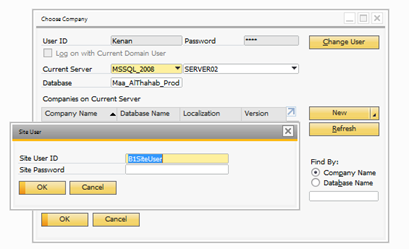 The equivalent configuration menu is Administration > System Initialization > Company Details – Basic Initialization tab. You have the option to select a different chart of accounts template, but you cannot change the template after postings have been made. 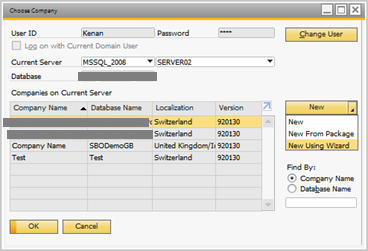 You can enable the use of segmented accounts as available in the localization. Administration > System Initialization > Company Details – Basic Initialization tab. Add accounts to the chart of accounts. Financials > Chart of Accounts. Select accounts for the G/L account determination. 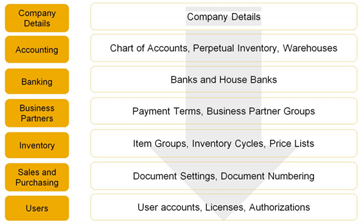 If you choose Chart of Accounts as “user-defined”, you need to select the default accounts. Administration > Setup > Financials > G/L Account Determination. Administration > Setup > Financials > Tax. Enable the use of fixed assets and other functions, depending on localization. If you enabled fixed assets, you will have the option to define depreciation types, areas, and asset classes. 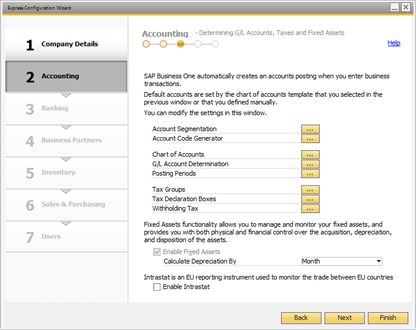 Specify the Accounts, Depreciation Types, and Classes. 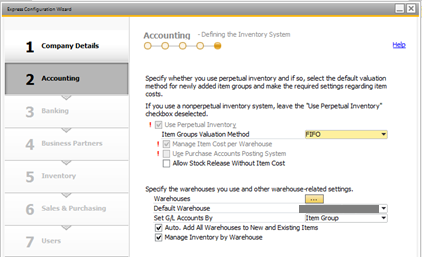 You can enable and set up information for perpetual inventory such as a default valuation method. From Administration > System Initialization > Company details Basic Initialization tab. Here you can also define warehouses and indicate the default warehouse. You can do this from Administration > Setup > Banking. The banks table holds the country codes and bank codes for the bank that the company deals with. The house banks table holds bank and branch information for the bank codes defined in the banks table. The business partners step allows you to define default payment terms and payment methods, dunning terms, and groups for business partners. 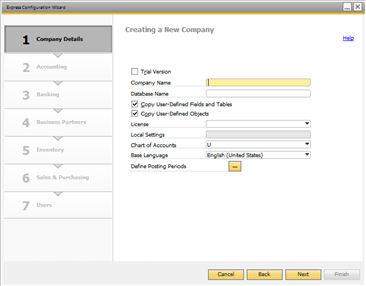 The equivalent configuration menus are Administration > General Settings – BP tab and Administration > Setup > Business Partners. Units of measure and units of measure groups. Item groups and inventory cycles. The equivalent configuration screens are found under the menu Administration > Setup > Inventory. New Price Lists and item prices in a price list (assuming items exist in the new company). This is equivalent to menu Inventory > Price Lists. General and per document type settings. 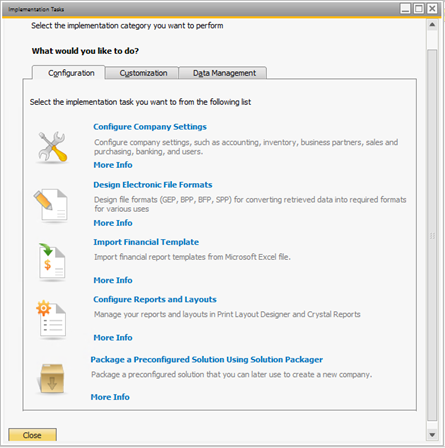 The configuration menu Administration > System Initialization > Document Settings. How decimal places are displayed in documents. 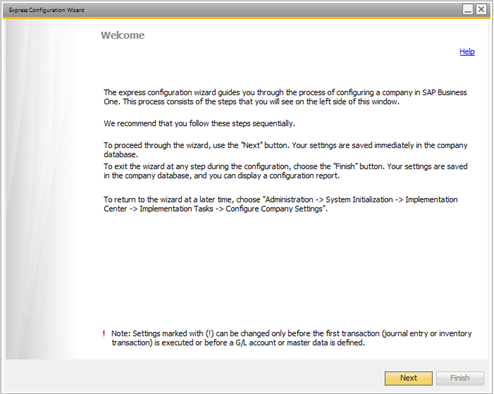 The configuration menu Administration > System Initialization > General Settings – Display tab. Document numbering series for each document type. The configuration menu is Administration > System Initialization > Document Numbering. 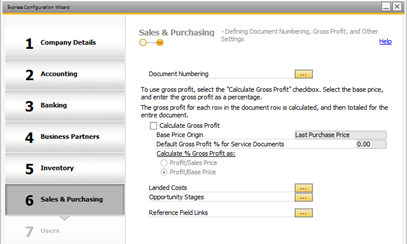 You can set the way gross profit is calculated in documents. You can also set up landed costs allocations for purchasing and identify stages to define the company’s sales process. 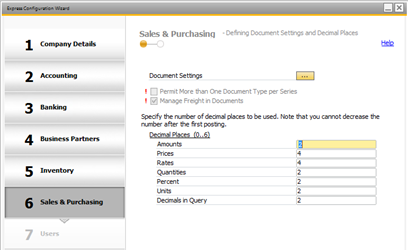 The equivalent menus are Administration > Setup > Purchasing > Landed Costs, and Administration >Setup > Sales Opportunities. You can select fields from documents as reference fields for journal entries. The equivalent menu is Administration > Setup > General > Reference Field Links. 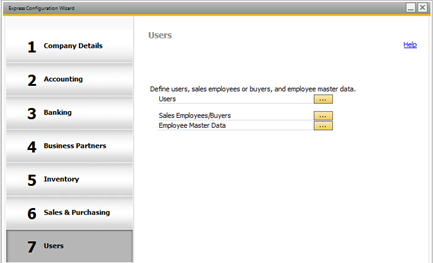 In the users’ step, you can define user accounts and designate employees as sales employees or buyers. Administration > Setup > General > Sales Employees/Buyers. equivalent to the administration menu Administration > License > License Administration. equivalent to the administration menu Administration > System Initialization > Authorizations. You can create master data for the company’s employees – equivalent to the menu: Human Resources > Employee Master Data. Employee master data is required to set up data ownership authorizations. To complete the configuration, you can set General Settings. These settings cover a wide range of defaults and initialization parameters for different areas. Choose Administration > System Initialization > General Settings and select the required tab. Note that some vocalizations may have additional tabs in the General Settings. These settings are grayed-out in the wizard and cannot be changed after transactions are posted.